The word ‘agility’ has been associated with different types of dog training for many years. It has been used for several years to train working, protection, search and rescue dogs and to instill confidence in dogs. In the late 1980’s, a new form of agility developed into the exciting and fun sport that we see today. The Crufts show (England) of 1978 debuted this new sport to the world. It is similar to Grand Prix show jumping for horses, except that dogs are guided to crawl through tunnels, to walk on narrow planks, and to jump over hurdles. Agility combines the elements of athleticism, speed and handler control, marrying military K-9 courses with horse show jumping. The large outdoor agility ring looks like a giant playground for dogs, with its brightly painted and decorated jumps. The four-footed athlete maneuvers through the course with tail wagging and muscles rippling, always attentive to the handler’s verbal and hand commands. Agility requires the canine to crawl, jump, twist, balance, and climbthrough a prescribed course of obstacles at top speed, covering a very large area. The agility obstacles that make up a course can be classified into general types, such as hurdles, tunnels, weave poles and contact obstacles (dog walk, ‘A’ frame and see-saw). Each of these types of obstacles tests a different aspect of the word ‘agility’. For example, the see-saw tests nimbleness and confidence; the tunnels, confidence and trust; the weave poles, flexibility and coordination; and the decorative hurdles determine jumping ability. The judge configures 15 to 20 obstacles (the number varying depending on the title-giving organisation) into a course that is different at each trial. So, unlike obedience where the pattern can be taught, agility is different each time the dog and handler line up at the start line. But the physical demands of the sport do require conditioning of both handler and dog. Although the dog and handler are only running on most courses for seventy seconds or so, the handler needs to be able to run to direct the dog on the correct route. The canine has to use every part of its body to physically negotiate the obstacles, so fitness is a must. It is great for dogs that have become bored with competitive obedience or other types of training. Because of its positive training, agility can improve the dog’s attitude in obedience work. The dog’s eagerness to work with the handler is something that both spectators and competitors comment on. In Canada, the major national agility title-giving body is the Agility Association of Canada (AAC). The AAC was formed in 1988. The founding president, Art Newman, from Ottawa, wanted the AAC to promote international standards of competition, and thus adopted the type of agility that was seen at the Crufts show. The AAC awarded its first titles in 1990. AAC competition is open to all dogs regardless of pedigree. Other agility organisations that have offered trials occasionally, in certain areas of the country, are the North American Dog Agility Club (NADAC), and the United States Dog Agility Association (USDAA). In 2000, the newcomer to agility is the Canadian Kennel Club (CKC), with the first trial to be held in Ontario in May of 2000. Their agility trials are only open to CKC-registered dogs. So far, most of the trials available are in the province of Ontario. The only other currently-scheduled trial is in BC. Hopefully, with the growth of this sport in the CKC, there will be trials across the country in the near future. Each of the title-giving organisations offers a different flavour or type of agility. Through their rules, the focus is shifted to different aspects of the sport. Under AAC and USDAA rules, a perfect run is required in order to receive a qualifying score, whereas the CKC and the NADAC allow a percentage of errors and a qualifying score can still be achieved. In the CKC trials, there are no weave poles in the beginning level, resulting in a shorter training time, as weave poles are one of the harder obstacles for the dog to master. These differences offer different challenges to the dog and handler team. The AAC offers four levels of competition: Starters, Advanced and Masters. With each level, the number and complexity of the obstacles increase, and the time in which the course is to be completed decreases. A title-earning score is a perfect zero, meaning that the handler and dog incurred no handling, jumping or time faults in running the course. All jump heights are based on the height of the dog at the withers. Westies that are 12 inches or less at the withers would jump in the 10-inch division. The Veteran class is for dogs seven years of age and over. The dog jumps one height division lower than they are measured for. Also the A-Frame’s apex is lowered to 5 feet, and all spread hurdles are removed from the course. For the Westie that is jumping 10 inches, in this class it would then jump 6 inches, a comfort to ageing joints. Since not all breeds are constructed for jumping, the Bulldog for instance, the AAC offers a Special class where the dog jumps one height division lower than they are measured for. In both the Special and Veteran’s classes a dog can attain all the title levels. The titles granted are Agility Dog of Canada (ADC) from the Starters class; Advanced Agility Dog of Canada (AADC) from Advanced class; and Masters Agility Dog of Canada (MADC) from the Masters class. The top level title is Agility Trial Champion of Canada (ATChC), for the dog that has achieved MADC plus Master Game Dog of Canada. There is a lot to run, jump and climb for in the AAC! The four AAC games are Jumpers, Gamblers, Snooker, and Team Relay. Each of these games are offered at the Starters, Advanced and Masters levels. There are titles that can be attained to earn the Master Game Dog of Canada. There is a lot to run, jump and climb for in the AAC! To encourage younger handlers in the sport of agility, the AAC has a Junior Handler’s Programme for children up to the age of seventeen. This graduated programme of testing leads the handler to be ready for the Starters level. The dog does not have to be owned by the junior handler. The CKC offers three levels of competition – Novice Class (earning a AGN); Intermediate Class (earning a AGI); and Excellent Class (earning a AGX). There is a further title, the Agility Master title (earning a AGMX) where you keep taking the Excellent B Class test, passing it 10 times with a perfect score of 100 to earn the title. Each level is more difficult than the previous and requires more control on the part of the handler and dog team. The CKC rules are very similar to American Kennel Club’s agility rules with the same jump height divisions of 8 inches, 12 inches, 16 inches, 20 inches and 24 inches. The majority of Westies seem to measure for the 12-inch height division, as the cut-off is over 10 inches and up to and including 14inches. If your Westie is 10 inches or under it would be in a jump height division of 8″. Few Westies that have ventured into this exciting sport in Canada, but those that have, have done very well and stretch across the breadth of the country. The first Westie to earn the title Agility Dog of Canada (under AAC rules) is Duffie, Riada’s Primrose C.D. She won her title on August 8, 1992, in Saskatoon, Sask. Duffie is owned and handled by Anne Matheson and was bred by Joan Mitchell. The first Westie to earn an Advanced Agility Dog of Canada title (AAC rules) is Maggie, Towynridge Once Upon a Time CDX, Am CDX, Ber CD, TD, VMADC, AAD, AX, NAJ, NAC, NJC, NGC, FDX, CG. CGC, who earned it in 1993. Her owner and handler is Jane McLaughlin of Toronto, Ont. and she was bred by David and Joanne Davidson. 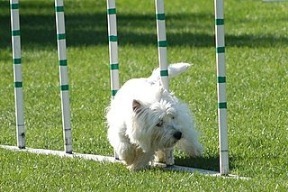 Maggie was the Westie pioneer in agility starting way back in 1987. Duffy is owned and handled by Mary Zacharatos of Prince George, B.C. and is the first Westie to earn Veteran Masters Agility Dog of Canada (under AAC), having done so in May, 2000. Mary feels fortunate to run Duffy in agility, as she could not register him to participate in CKC events. The first dog and Westie to earn an Agility Novice title in CKC agility is Kyla, Ch Hayastan’s Kinetic Kyla, CDX, Amer CD, AADC, OA, AGN, NGC, CG, CGC who did so on May 7, 2000. Kyla is owned and handled by Jane McLaughlin, and bred by Dorothy Grocott. This sport offers a whole new possibility for fun and teamwork with your Westie. Try this great sport and see where it leads you.